BUGS ARE OUR BUSINESS. FREE ESTIMATES! 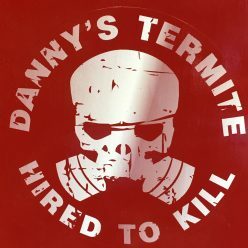 Subterranean termites are endemic to central Kentucky. These are very concerning to most home owners as they can cause substantial damage to their property. Termites live in the soil for moisture but need wood for food. Therefore, wood in contact with soil is the perfect condition to develop a termite infestation. However, some termite colonies have been found to cross over foundation walls that separate wood from the soil. Subterranean termites are frequently confused with ants. 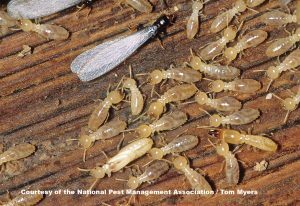 Termites swarm at certain times of the year. They are doubled winged like ants but their wings are equal in length, whereas ants are unequal. Termites antennae are not elbowed and they have narrow evenly thick waist. Ants have a thin waist. Termites do not have eyes. As seen in the picture above, termites do not all have the same appearance. Each termite has specific duties in the colony. The most commonly seen termite is the primary reproductive, also called swarmers. These are usually the first sign of an infestation. The swarmers are detected by the home owner sometimes only after several years infestation which can mean potential property damage long before they are seen. We partner with you to protect your home from damage by these pests. If your home is not protected from termites, call us today. We use EPA approved chemicals to safely treat and protect your home.